To me, none of these options gives a good user experience; I find the best approach is what many ATMs do, which is to allow you to enter only the digits, but have a fixed decimal separator. So, to enter '123.45' you would type 1-2-3-4-5; to enter '18.00' you would type 1-8-0-0; and so on. 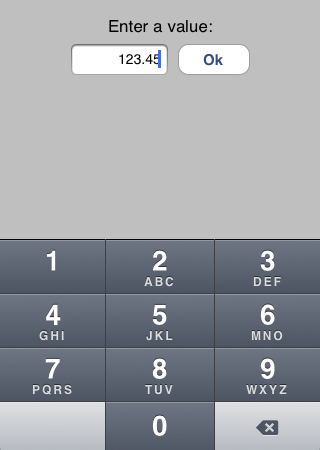 In this post, I am going to do this in iOS with a text input and a numeric keypad. The Objective-C code for this is available on github. I could then link up the view controller as the text field's delegate in interface builder. The textField:shouldChangeCharactersInRange:replacementString: callback to the text field delegate gives us a useful place to manipulate the data in the text field as the user interacts with it (through typing on the keypad, deleting, cutting or pasting). I initialise the maximumFractionDigits and decimalSeparator instance variables in the constructor using a NSNumberFormatter, which can tell you what they should be for the specified locale or currency. If the user is entering a fixed precision number and not a currency, these could be hard-coded instead. And that's it. Clone the code from github to see a full, working implementation of this. Note: The methods I've used are from the UITextInput protocol, which UITextField implements in iOS5 and up. The cursor positioning code therefore only works on iOS5 and up. Check out the updated code in the github repo. There is still one bit of behaviour which could be better: when the cursor is to the right of the decimal point and the user hits backspace, nothing happens. Ideally, the digit before the decimal point should be deleted. A future update will fix this. As pointed out by Alexander Zubkov, the code wasn't working properly for locales with a decimal separator that is not a period. I was not taking the decimal separator into account everywhere. I've made some changes to the code to fix the issue. Great solution, thanks. And good call on the internationalization. Unfortunately this does not work as the user expects if he positions the cursor in the middle of the text and then adds/deletes a character. In particular, the cursor jumps to the end of the field. Trevor - indeed, the cursor jumping to the end when you manually place it in the middle of the text and type is one edge case which doesn't work quite right. I'll look at updating the code. Trevor - I've updated the code to correct the cursor jumping to the end of the field. Would you please be kind enough to have a look at my issue here, I believe you may be able to resolve what I am after. Basically I trying to type into an Empty UITextView with formatting With Left and Right Padding? I have worked out the formatting but I can't workout how I can use shouldChangeTextInRange to maintain the formatting and the cursor position. It won't give the desired result for users from Germany or Russia. I assume it's because of NSNumberFormatter that gives different decimal separator. When you push any digit it doesn't add it. Instead if you have any preloaded number (12.05) it will clean it up to 0.00. Alexander, you are right. Thanks for spotting that it didn't work when the decimal separator is not a period. I should have tested it for different locales. I have now fixed it so it does work (see commit in github for changes). Nice, I would like ti know how will you approach the case if you want to update the String/Number that is unputed by the user for example 1000 to 1,000 adding the coma while the user is entering the number? var selectedRange: UITextRange = textField.selectedTextRange! var newPosition: UITextPosition = textField.positionFromPosition(textField.beginningOfDocument, offset: newCursorOffset)!